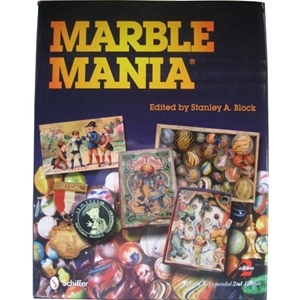 Marble Mania by Stanley Block is a excellent book for new collectors as well as seasoned collectors. A wealth of information on handmade and machine made marbles, clays, porcelains, glass, minerals, chinas, etc.. Contains a good section on marble boxes and manufacturers as well as toys and other items of collecting interest. Over 1,300 photos/drawings etc. This book should be a collector's first. 238 pages and published by Schiffer Publishing Ltd..